Available in a variety of colors and specifications, our polypropylene webbing is manufactured to the highest of standards. Polypropylene webbing is inexpensive and strong, allowing for use in many fields such as the luggage industry, the medical industry as belts, lifejackets, bags and more. Polypropylene webbing is typically used in the medical and fashion industries. Since it has less abrasion resistance in comparison to nylon, it should not be used in weight bearing situations. While nylon and polyester webbing are perfect for holding heavy loads, polypro commercial webbing is more appropriate for belts, bag straps, and life jackets. Polypro is also a less expensive material than nylon or polyester. Polypropylene medical straps can be found on gurneys and stretchers. These straps are utilized to hold a person or item in place that requires lower tension strengths. For instance, the average person weighs about 150 pounds. Polypro has the break strength of approximately 150 pounds, but in situations requiring a break strength that’s much higher, such as holding building materials in place, polypro would not be the right choice. Lower abrasive strength also limits the situations in which polypropylene webbing should be used. If the strap will come in contact with an abrasive material, reduced holding capacity will ensue. This could cause polypro straps to break more quickly. Polypro offers natural UV protection, making outdoor use ideal. The material does not absorb water, so mildew and rot are not a problem with polypro webbing. Outdoorsmen often use polypro webbing to replace tent straps or tie down straps that do not require high break strength. 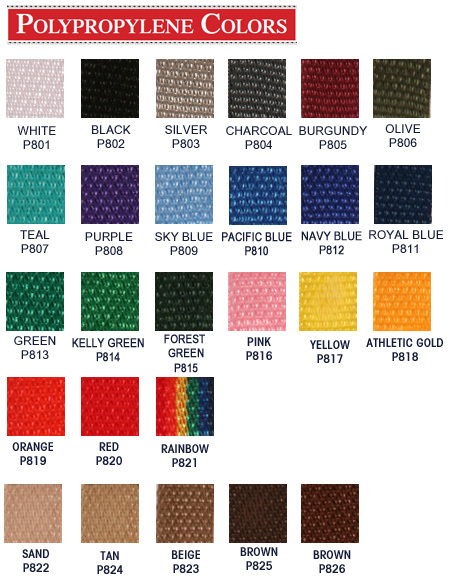 While all polypro commercial webbing offers reduced strength, different grades are available depending on the needs of the consumer. 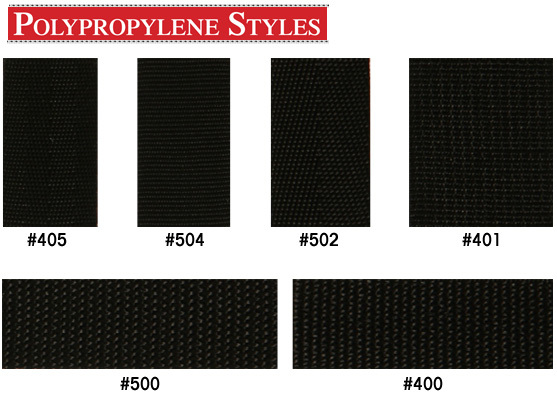 Polypro webbing is often available in lightweight, medium-weight, heavyweight, and high tenacity varieties. Differing widths are also available to increase break strength. 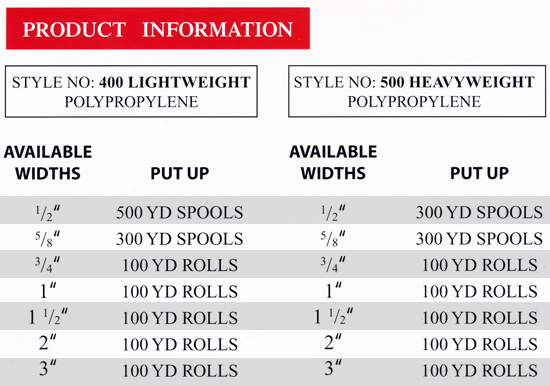 Polypro is not as bend resistant as polyester, so heavier weights may cause the webbing to bend or stretch. Heavyweight polypro webbing can have a break strength of up to 1800 pounds. Lightweight webbing typically breaks at 375 to 750 pounds. Polypropylene webbing can be used in situations where high temperatures are constant due to its high melting point of 340 degrees F. California Webbing Mills is available to assess your specific project needs. Contact us today with the details of your project and one of our experts can help you choose the right material with respect to width and break strength. California Webbing Mills has a commercial webbing to meet your every need.